Free Panda Express Orange Chicken on Friday, 6/21/13 after 9pm! Are you a fan of Panda Express? How about Late Night Munchies? 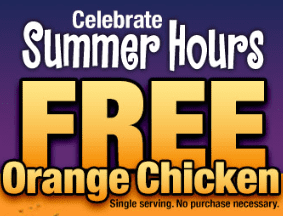 Well on Friday, June 21, 2013 Panda Express is celebrating their late night hours this summer with free Orange Chicken! Simply print out this coupon or show it on your mobile device after 9pm on 6/21/13 to grab your freebie! Yum!